It is National Insect Week from the 20th to the 26th of June. I’ve always been afraid of creepy crawlies, and it’s something I didn’t want my children to learn from me. I want them to be curious about the insect world, not afraid of it! To celebrate National Insect Week, the wonderful people over at Learning Resources sent me a bug hunting package, so that we could get out and explore the wonderful world of insects in time for the event. In the package, there were four items from the Geo Safari Jr range, including the Night Owl Bright Eyes Magnifier, Science Utility Vehicle, Bug Opticals and Kidnoculars. We were so excited to try them out! The Bright Eyes Magnifier is a cute little owl shaped magnifier. Each eye has a different strength of magnification, 2x and 8x, and the eyes both have a handy little red light, perfect for spotting beasties in lower light conditions. The eyes allow you to temporarily trap an insect under them so you can get a better look without them getting away. The texture of the products is great, and the grip hole is the perfect size for little hands. The Science Utility Vehicle (or SUV, as my husband pointed out, I didn’t even realise!) was the kids favourite. You can push down on the handles to reveal a magnifier inside. It has lights inside too, so so you see things clearly. It’s a great toy for exploring in the grass, the magnifier in it is great. It’s a robust little thing too, my children are quite rough with their play and it has withstood plenty off knocks and bangs. The kids love this, and when they are not exploring with it, they are simply playing trucks with it. It has recently been shortlisted for three Loved By Parents awards, and I can see why! This is a really fun and educational product. It’s shaped like a bug, which was an instant hit with the kids. It has 6 wings, and each of the wings features something different. There are three primary coloured wings, which can be overlapped to make secondary colours. 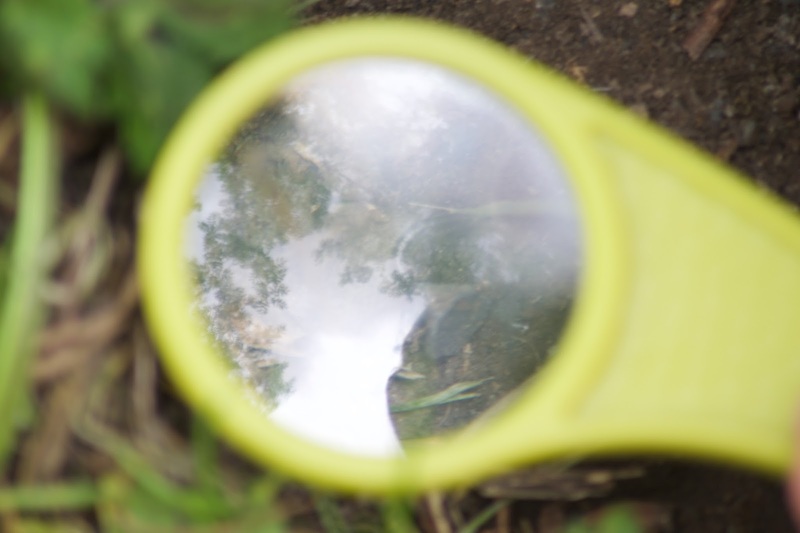 There is a special ‘bugs eye view’ wing, so you can see the word through the eyes of a mini beast, and then there is a 2x magnifier, and a 5x magnifier. The two magnifiers can be overlapped to make a 10x magnifier, which is perfect for viewing small bugs likes ants. I love that this teaches children about colours, and the kids loved overlapping the different wings to see what they could make. The Kidnoculars are designed with kids in mind. They have comfortable support around the eyes, and are big, chunky and robust so can withstand any stress the kids may put them through. They have a cord so they can be worn around the neck, with an easy pull clasp so they can be pulled off quickly. They are fixed length, which means no faffing around trying to focus. The kids love them, and they have been fighting over who gets to wear them first when we go out. 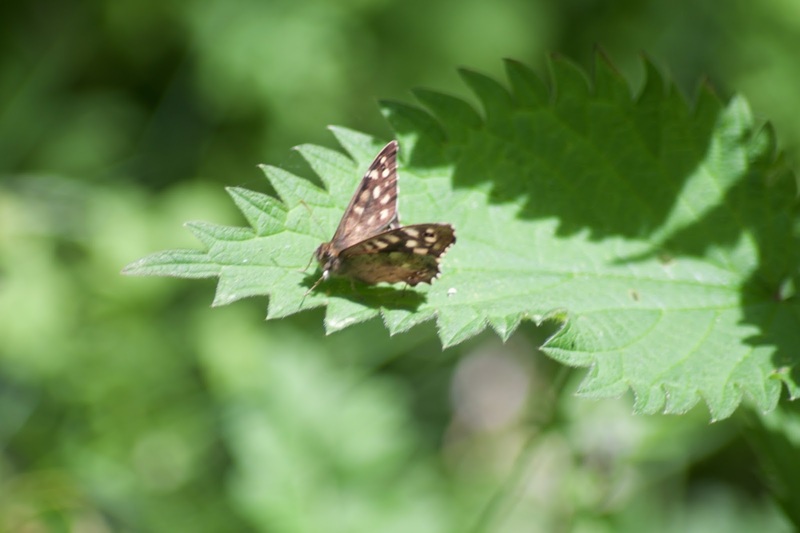 They are great for spotting butterflies and bees in the distance. Going on a bug hunt! 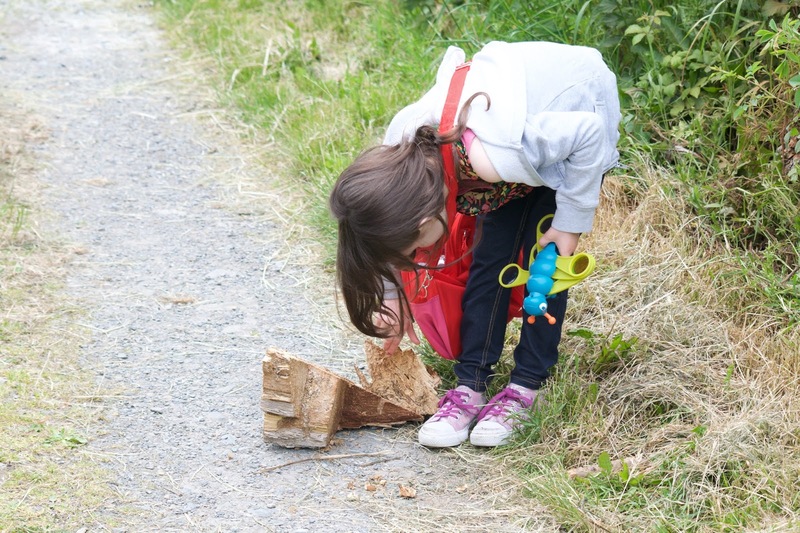 Once we received the toys and had a little mess around with them, it was time to take them out on a bug hunt. 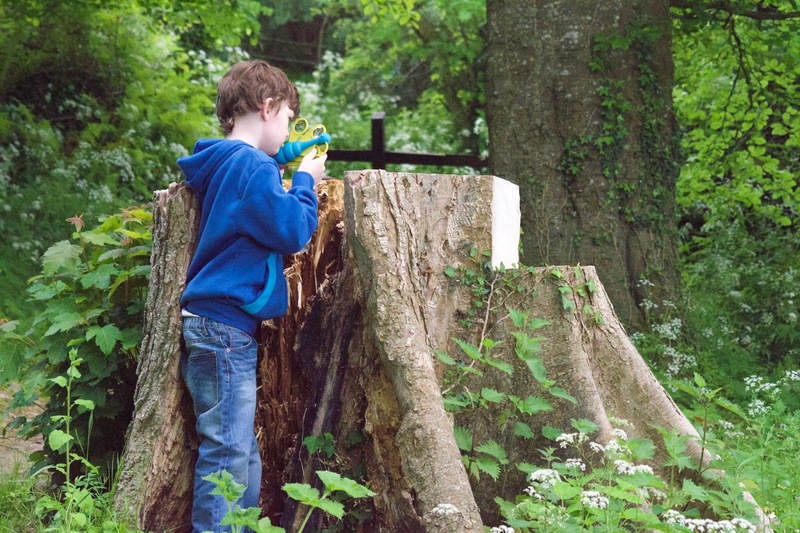 We headed out to a local woodland area to see what we could find. We searched in the bushes and trees, and under bit stones. Overall, I’m ver impressed with the Geo Safari Jr toys. 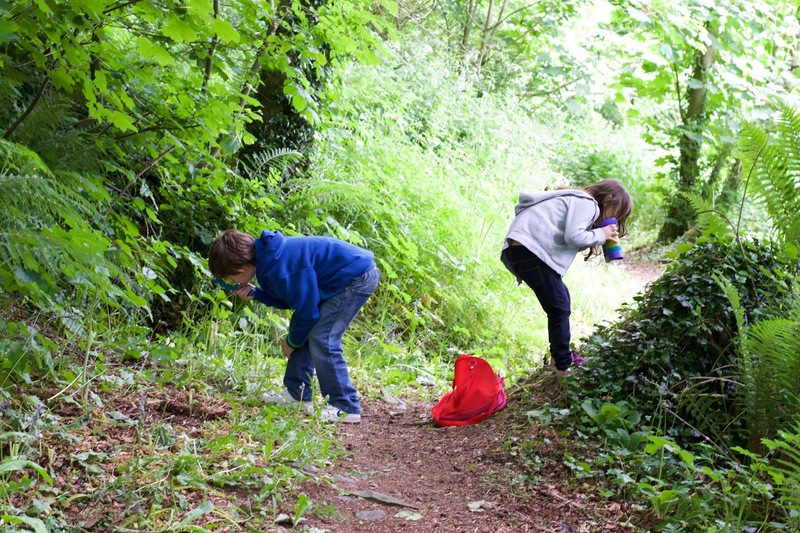 They have been a great way for us to introduce the children to the world of insects and mini-beasts, and we have had a lot of fun going out for adventures. The whole range available at Learning Resources looks awesome, and we already have our eye on a few of the other products! We were sent these toys free of charge for this review, however all opinions are completely my own. I didn't know there was a national insect week until we got the toys, there are lots of events taking place around the country for it! What a fun way of exploring the world around them, they are lovely and colourful but still practical to use. I love them! They are great, and very bright an colourful! I love learning resources too, I think they are my favourite shop for the kids! My little man would love these, he's always finding creepy crawlies in the garden! They are fantastic toys, and would be perfect for your wee man! Great post! I love learning resources and the toys are amazing! Those look amazing. Great ways to,teach kids about nature and, hopefully, not pass those fears of creepy things on.